In 2013 Telltale games released The Wolf Among Us. They promised that the story in it will be moved and dictated by the decisions of the player. The Wolf Among Us had five episodes, much in the style of a tv show and Telltale did good job in immersing the player in the story of the Fables. I liked it, quite a lot actually and it seems enough other people liked the idea of this kind of game, because Telltale has decided to recreate in similar manner Game of Thrones. For now six episodes are planed with the first is already on the market. I'm here to tell you what they have managed to do...in my opinion. WARNING: The following text contains spoilers about the game, tv series and the books, continue reading on your own risk. The game begins at the night of Red Wedding and you, for good or bad, are just a squire in the army of Lord Forester, bannerman of Stark. I'm sure that everybody knows what happens at that fateful night, but if by any chance you still don't...well, a lot of people die. But you somehow manage to save your hide, not that you have any choice, because the game will be over if you die this early. Anyway you manage to run away with your life and on the way back home...but let's stop the story here; after all I doubt you will play this game for anything but the story. The first thing that I saw when launched the game was that Telltale have kept their trademark style of bright and colourful animation even in this gloom setting. But don't let this mislead you, the developers have done great job recreating the atmosphere of Westeros. They have managed it by giving the player everything that can be found in G. R.R. Martin's world. At the start you are thrown in the middle of the biggest betrayal in the whole story, and the fact that you know what is coming is the thing that creates the pressure. But to have betrayals you need intrigues and have those you need a lot of talking. This is in fact what you will do 90% of the time in the game. But long dialogues can be really boring and annoying, that's why they're filled only with choices that are viable and important. Of course you won't have the luxury to try every one of them; neither you will have the time to think carefully, those are the Seven Realms, only quick thought and courage can save you. 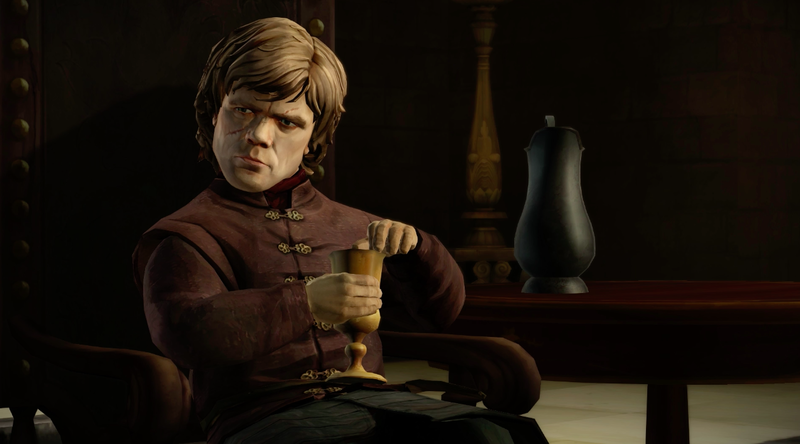 Telltale have done great job at catching the atmosphere of Westeros and if you can put yourself in the shoes of the characters given to you, you will only improve the experience. As in the books/tv series, here also every action, every move is vital, Every piece of information you can get is essential and every word spoken can be your end. And how it can be otherwise when the game starts in the night of the Red Wedding. This game should not be your first clash with the Song of Fire and Ice world, because it is clearly made for fans and people who know what is going on. Also if you plan to watch/read the series or you still haven't catched up with the show, don't touch the game, because it will surely spoil big part of the story for you. Публикувано от Sharki в 9:22 ч.